And we’re back in the cloud, back in Microsoft Intune. One of the things customers like to do is customize, as the standards are often to generic. The nice thing with the Company Portal is that it’s already possible to customize things like the text, logo and colors via both Microsoft Intune standalone and Microsoft Intune hybrid (integrated with ConfigMgr). 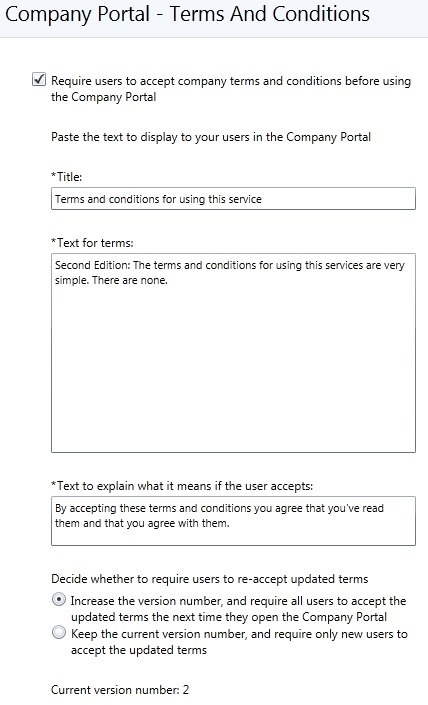 To add-on to that, it’s now also possible to create custom Terms and Conditions, via Microsoft Intune standalone, and in this blog post I’ll show how easy this can be done. The nice thing is that I can publish custom Terms and Conditions that the users will see when they first use the Company Portal. It doesn’t matter from which device and it doesn’t matter if that device is already enrolled or not. The users will have to accept the custom Terms and Conditions before they can access the Company Portal. 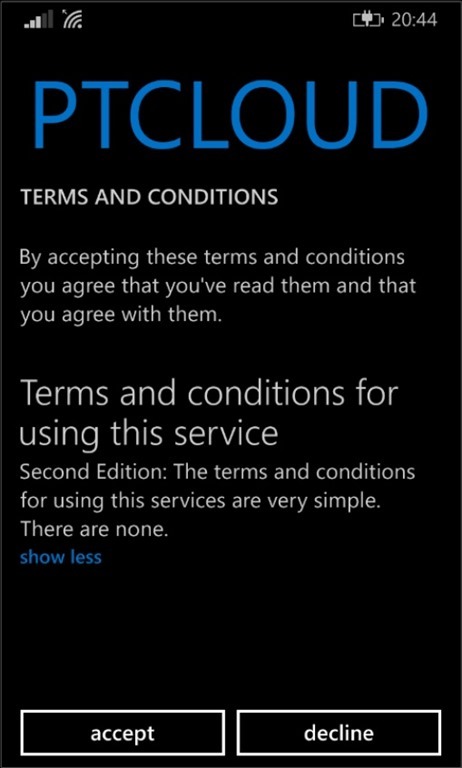 What makes it even better is that when I update the custom Terms and Conditions, I can choose if I want the users to accept the new Terms and Conditions again. In that case the user would have to go through the same process again when logging on to the Company Portal. The last positive note, for now, about custom Terms and Conditions, that I would like to point out, is that they apply to users and not to devices. That means that the users only has to accept each version once. Now let’s go on with the configuration, which, to be quite hones, is not very difficult, but good to know. I’ll go through the different settings and I’ll also try to show the behavior of the different settings. First let’s go through the different available settings, by going through the following three steps. In my opinion the most important setting is the last setting of the third step. With that specific setting I can decide what happens when I update the custom Terms and Conditions. Let me show that setting in a bit more detail by showing an example. 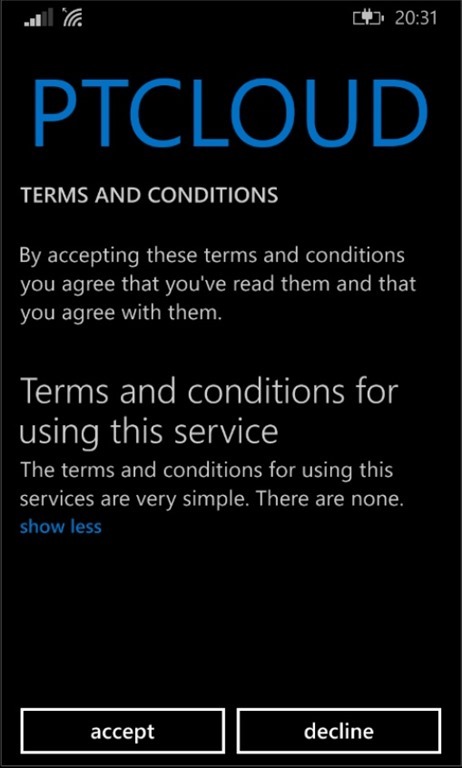 When I create initial custom Terms and Conditions, it will look like the following screenshots that include an example of what it looks like on Windows Phone 8.1. Now let’s have a look at what will happen when I update the custom Terms and Conditions. When I update the custom Terms and Conditions and select Increase the version number, and require all users to accept the updated terms the next time they open the Company Portal the version number will increase and it will directly impact the users as shown in the following screenshots. When I update the custom Terms and Conditions and select Keep the current version number, and require only new users to accept the updated terms nothing will change for the end user. Simple conclusion is that a major change should always require an increase of the version number. Besides accepting the custom Terms and Conditions the user can, off course, also decline them. In that case the user will be given an additional question of Are you sure you want to decline the terms and conditions?, including an explanation of what it would mean for the user. Now the last thing I would like to know is which users accepted the custom Terms and Conditions. The good thing is that Microsoft Intune standalone has a canned report that shows which users accepted the custom Terms and Conditions. This includes the information about the most recent version number that the user accepted and the date and time it was accepted. 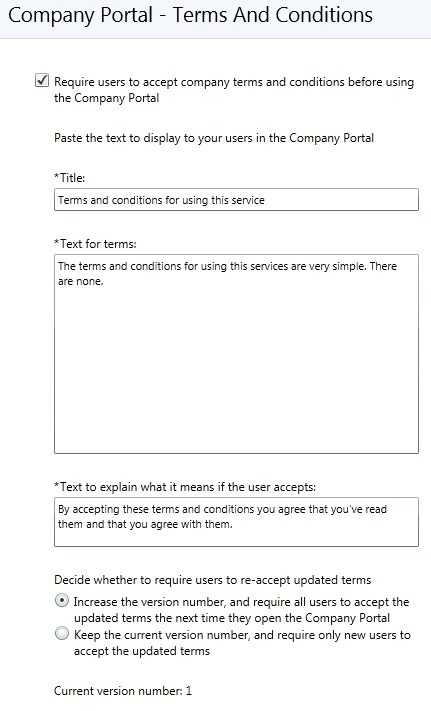 For example, below are two examples about a user that accepted the initial custom Terms and Conditions and later also accepted the renewed custom Terms and Conditions.